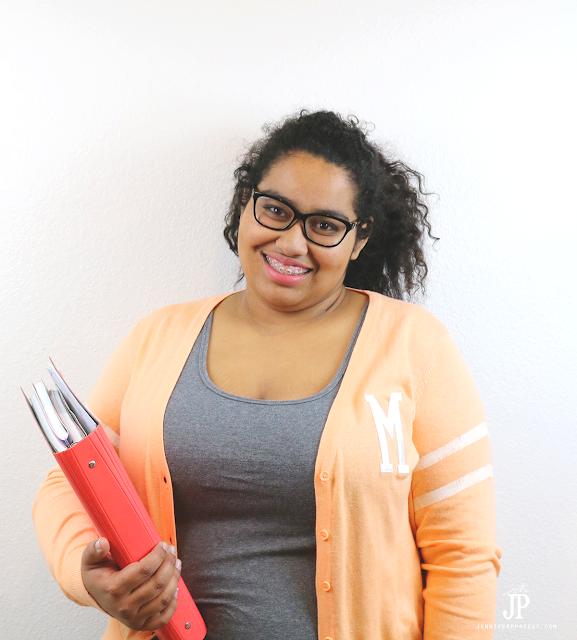 I can't even tell you how much fun I had making this girl's letterman sweater for spring! I have been loving how cardigans are back in style and so easy to find at every store, but they all look rather plain. I was inspired by collegiate letterman jackets to create this super easy monogram sweater. The Joy letters are what really "make" the sweater - giving it a rich, custom-embroidered look instantly. Lay the sweater flat and tape stripes on one arm. 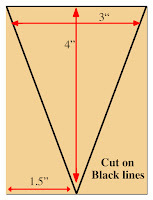 Measure the distance from the top of the sleeve to the first tape line on the first sleeve. Place tape on the second sleeve at the same distance from the top of the sleeve. Using a foam brush, paint the masked stripes with white fabric paint. Allow to dry at least two hours. Flip the sweater and repeat the masking and painting on the back of the sleeves. Allow to dry at least 2 hours. Place the letter on the sweater with an ironing cloth on top. 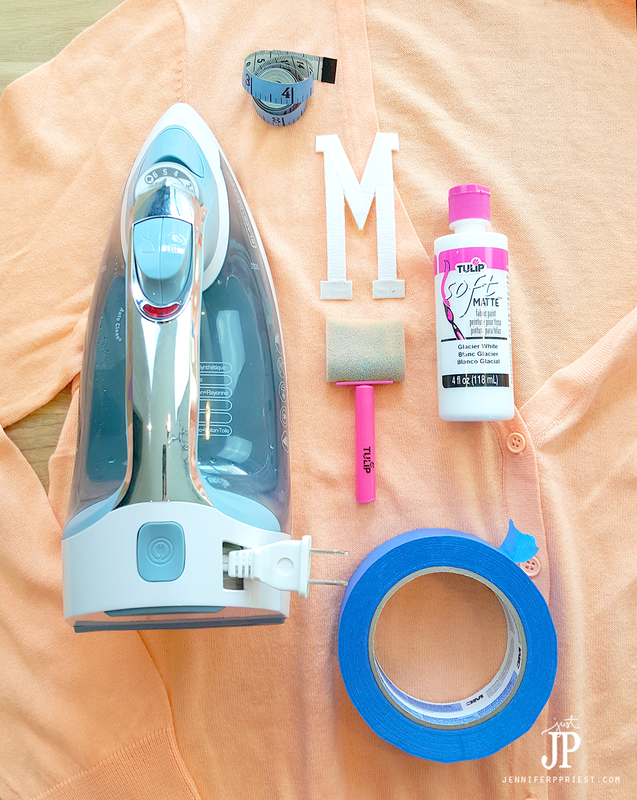 Iron with a hot, dry iron for 30-45 seconds until the letter is fixed in place. Remove the ironing cloth. Allow sweater to cool before wearing. Thanks for stopping by! See more projects like this on my blog Just JP. Joy embroidered letters are just the thing for creating. They come in a variety of colors and shapes; and they adhere to a lot of unconventional surfaces - like painted wood! 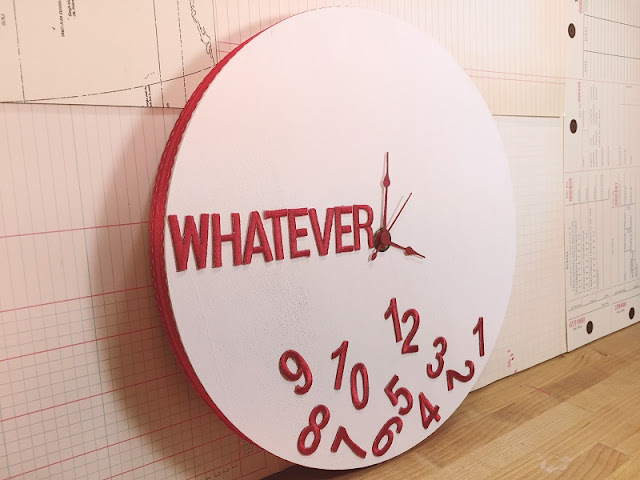 This clock was quick and easy to make in under an hour. 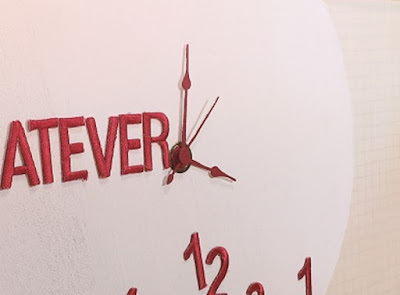 Paint a Walnut Hollow round wood clock base white. Apply a second coat, if necessary. 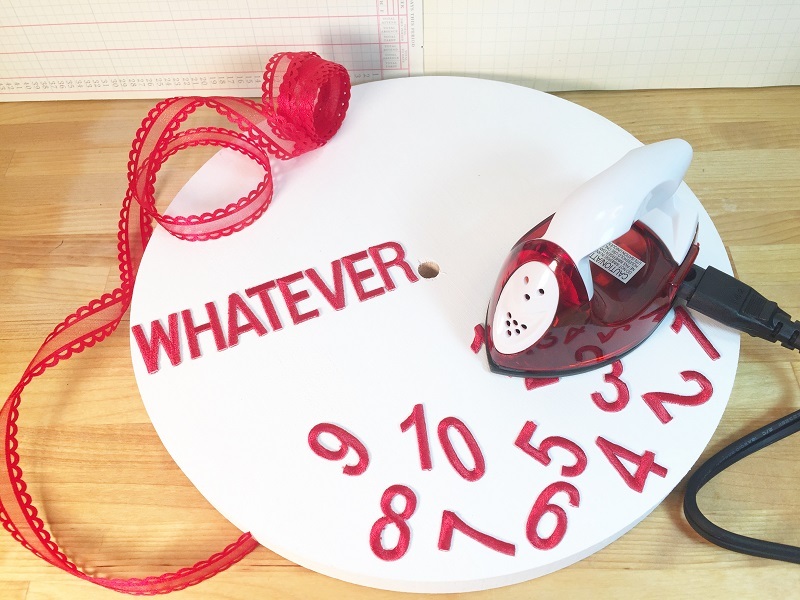 Place Joy 1" block letters to spell "WHATEVER" along the 9 o'clock line of the clock. Iron on according to package directions. I use a craft iron that does not have any steam holes in the bottom. I find this gives a quicker and more durable bond. Place a set of Joy numbers 1-12 in a random, jumbled pattern at the bottom, as if they have fallen off the face of the clock. Iron on according to package directions. Adhere a decorative red ribbon around the edge of the clock base. Paint the hands of the clock movement red. Let dry and apply a second coat. Coat with a spray sealer. Assemble the clock movement according to package directions. Insert battery, set time and hang. Check out the Joy Facebook page for tons more inspiration! If you're making artist trading cards to swap with a group, try using the letter for each artist's first name for your theme. Start with white Joy embroidered letters and color them with markers to match a unique color palette for each artist in your ATC swap. 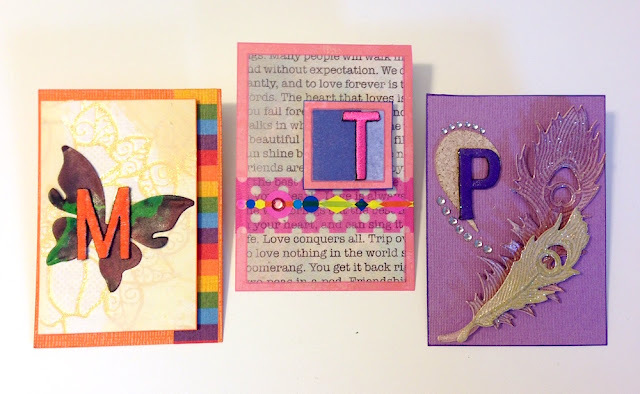 Everyone feels a certain affinity for their own special letter - they are sure to treasure your ATC for years. Banners can be created in all shapes and sizes from a variety of materials, depending on where you want to hang them. 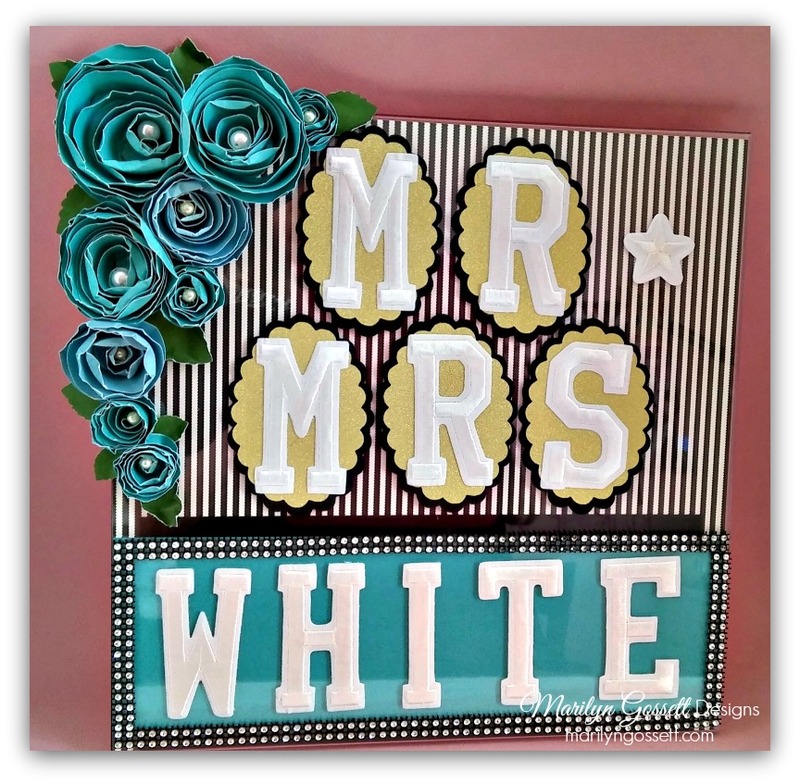 Whatever style you choose, they all need letters to create greetings, sayings, names and more. 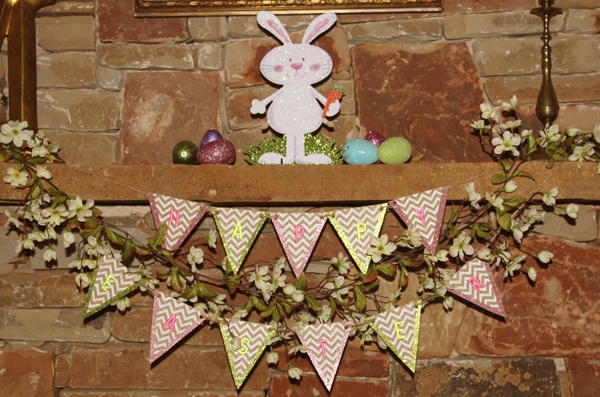 This simple Easter banner was created by stringing pennants together and adding embroidered letters to spell out "HAPPY EASTER". 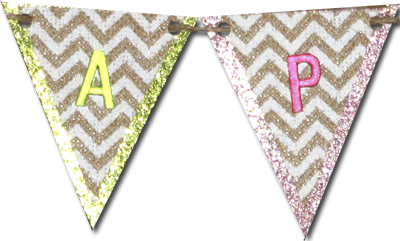 The pennants were made from glitter card stock and burlap ribbon. 1. Cut one, 3" x 4" pennant from the ribbon for each letter. 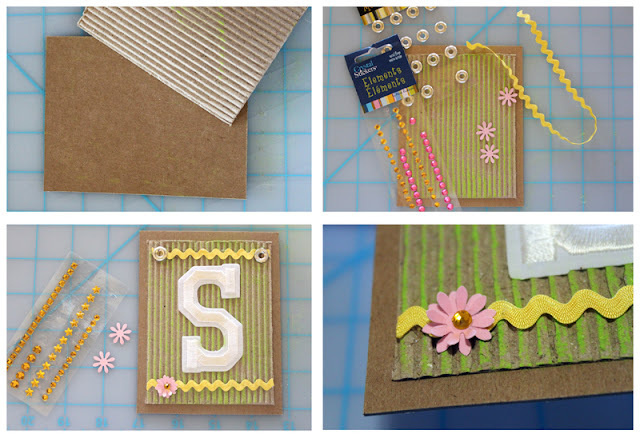 Glue to the glitter card stock then trim the cardstock 1/2" from the sides of the ribbon to create a border. 2. Punch a hole at each corner then adhere a letter to the center of each pennant. Thread jute through the holes to hang. 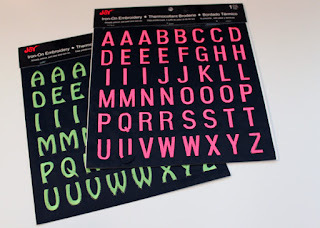 Joy embroidered letter sheets come in different colors and fonts. I chose green and pink to coordinate with the glitter card stock I already had on hand. You can find a large selection at your local craft store. Celebrate spring with a pretty banner in bright colors! I tied it to the bottom of my wrought-iron welcome sign to create a seasonal greeting. Cut six 5” x 6” rectangles from cardstock. Cut six 4” x 5” rectangles from patterned papers. 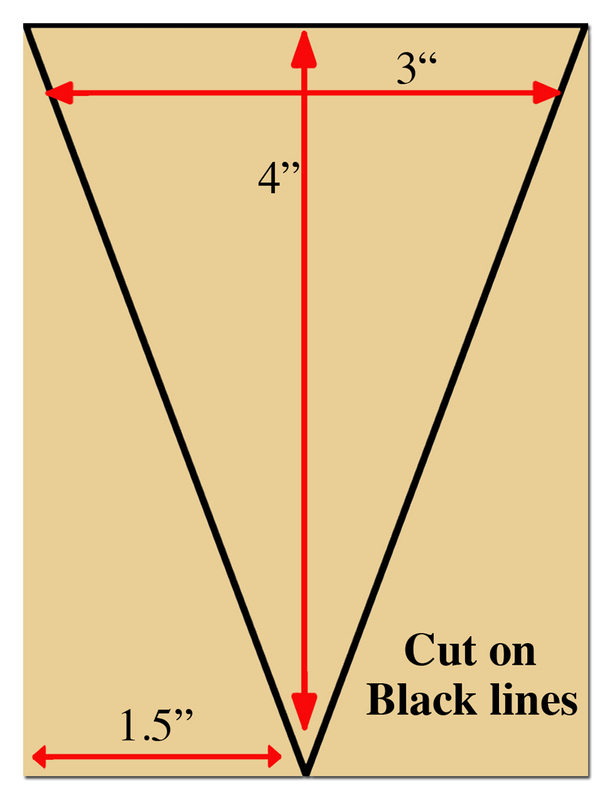 Cut notches into the bottom of all rectangles as shown. Glue patterned paper to coordinating cardstock for each flag in the banner. Remove backing from the Joy letters and adhere to the center. Add buttons to corners. Punch holes in corners and string each flag on to a long ribbon. A Wedding full of Joy! Weddings are a joyous occasion! We have a wedding coming up this summer and I am busy helping with DIY projects to decorate the venue. Last month I blogged about the table markers that I created with the Joy embroidered letters. I have completed the table marker project with this beauty that will sit at the head table with the bride and groom. To make hand-rolled paper flowers, cut cardstock into various sized circles 2" - 4" in diameter - they don't have to be perfect. Cut each circle into a 3/8" spiral. Leave a little circle in the middle. Roll the spiral into the form of a rose. Use a hot glue gun to secure the rolled spiral at the bottom. I use my fingers and thumbnail to distress the edges of the rose. Cut out leaves by hand or with a die-cutting machine. If you cut out a heart from a folded sheet, then cut the heart in half along the fold, you can more easily shape each half into a leaf. 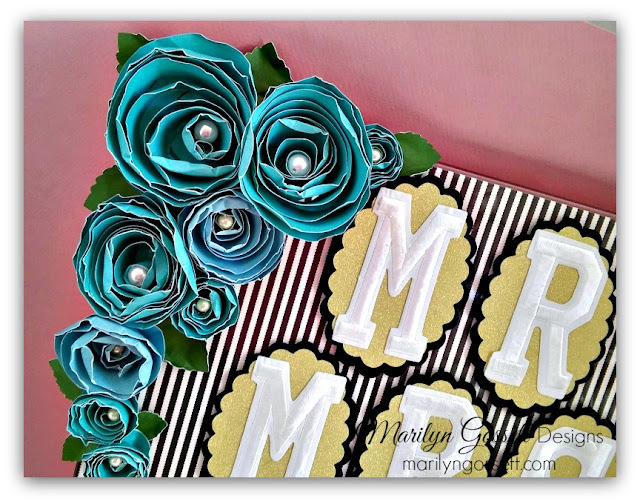 Cut the striped cardstock to fit the size of the acrylic sign holder, then trim black and teal sheets to fit behind the couple's last name. Layer and adhere these background papers together and slide into the sign holder. Die-cut a pair of scalloped ovals from cardstock (larger black and smaller gold glitter) for each letter. Glue to the outside of the sign holder, then center and adhere each letter on top as shown. Embellish your table marker with the flowers, leaves and rhinestone trim. Glue a pearl into the center of each flower. 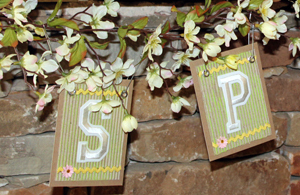 Spell your name in Joy letters, available at your local craft store! 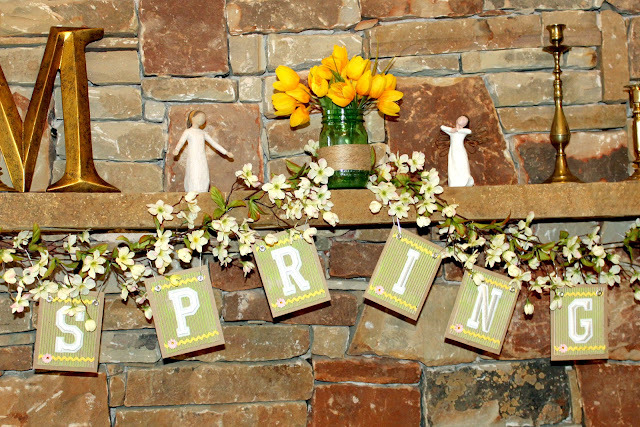 "Spring is sprung, the grass is ris, I wonder where the boidie is... "
There's still time to make a spring banner to brighten your home! Even though meteorological spring started at the first of March... Spring doesn't officially begin until March 20th. This spring banner will also work as an Easter decoration - just add eggs! NOTE: I had most of these in my stash of craft supplies, so always improvise and use what you have before heading to the store. 1. Cut six 4" x 5" pieces of chipboard and six 3-1/2" x 4-1/2" pieces of corrugated cardboard. 2. Adhere a corrugated piece to the center of each cardboard rectangle. 3. Lightly swipe chalk across the top of the corrugated cardboard to color. Remove the backing from each letter then press in place at the center of each rectangle. NOTE: Chalk is very dusty, so wash your hands thoroughly before handling the letters. 4. Cut and glue a piece of ric-rac to the top and bottom of each piece. 5. Place an adhesive silver ring at each end of the ric-rac at the top and a small flower at the bottom. 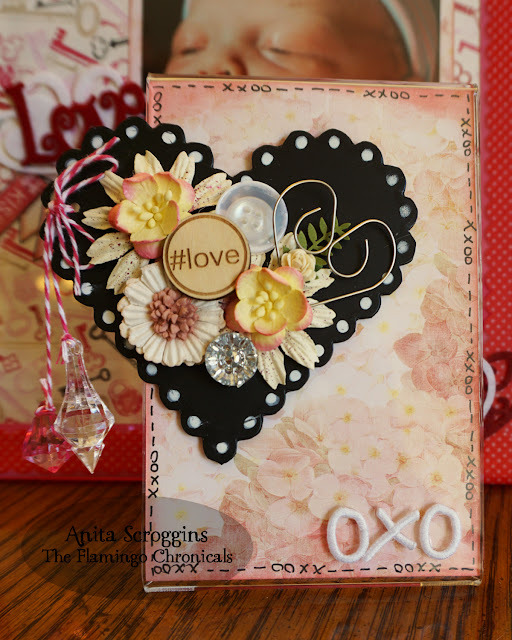 You can make your own flower by layering 2 punched flower shapes then adding a sparkly jewel (pink or yellow) at the center. Gently fold up the top layer of petals to create dimension. 6. Using the point of small, sharp scissors, poke a hole through the center of each ring at the top. I usually thread baker's twine, yarn or jute through the holes at the top of each piece to create a banner, but this time I used paper clip hooks. Unbend one paper clip for each hole, then hook the large end through the hole at the top of each rectangle. Hook the opposite end of the paper clip to a garland. Joy iron-on letters can be found at your local craft store. Enjoy! Easter is almost here and Joy embroidered letters are the perfect way to personalize Easter gifts. 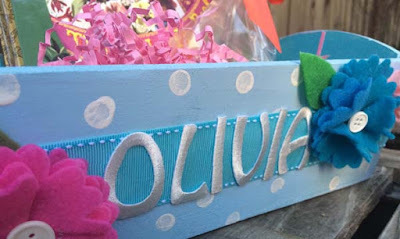 Joy letters come in many fonts and colors so you can style the basket for just about any taste. The great thing about this basket? Your child can use it after Easter for toy or book storage. Paint the wood crate with acrylic paints. I used a dauber to add painted polka dots. Once the paint has dried completely, glue a ribbon across the front of the crate. 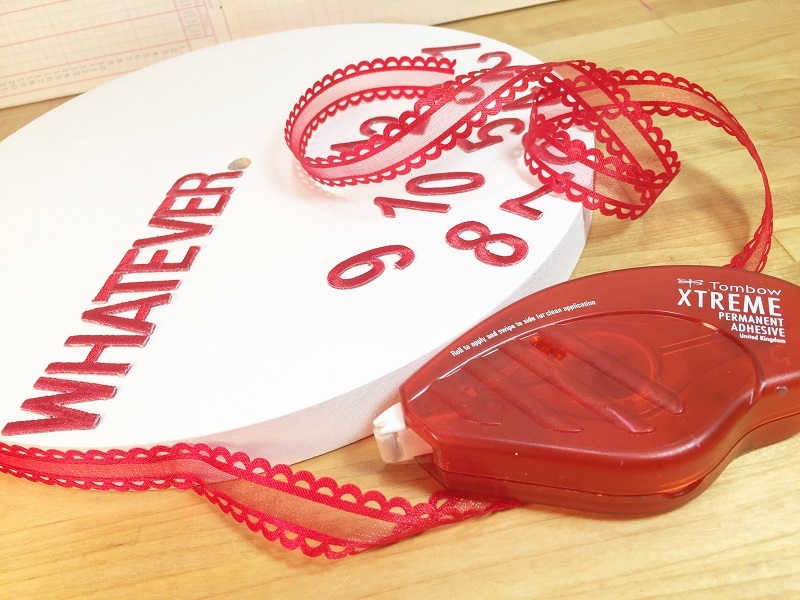 Glue the Joy embroidered letters over the ribbon. 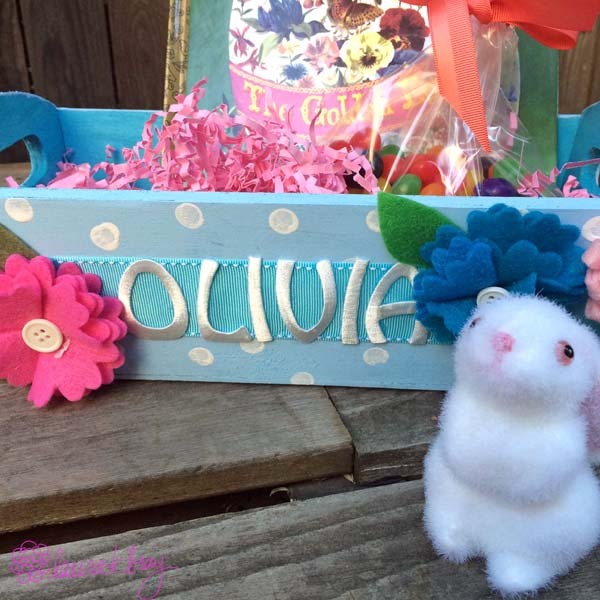 Glue felt flowers onto the front of the basket. You can get a video tutorial for felt flowers here. 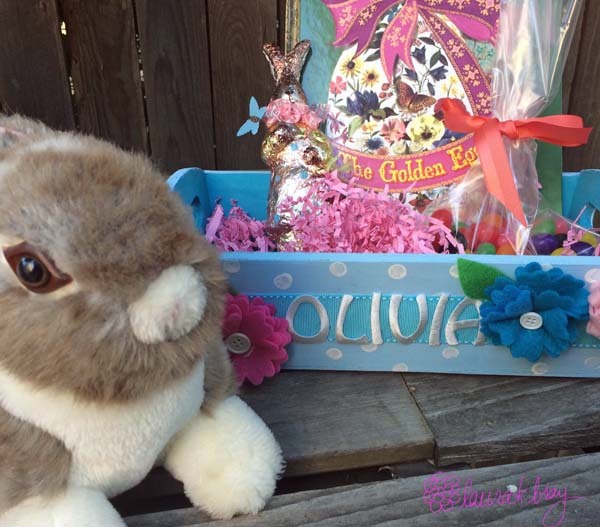 Fill the basket with paper shred, Easter books, toys, and candy of course! Happy Spring! 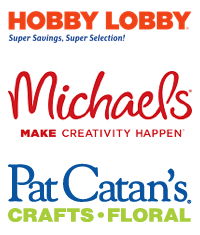 Look for Joy letters in your local craft store. Both of my daughters are grown now and have their own offices, so I am all about making beautiful things for their workspace. Taking simple things and adding Joy embroidered letters to them is a wonderful way to create personal projects for those we love. This embellished heart frame is just the ticket to sit on a shelf and look pretty. 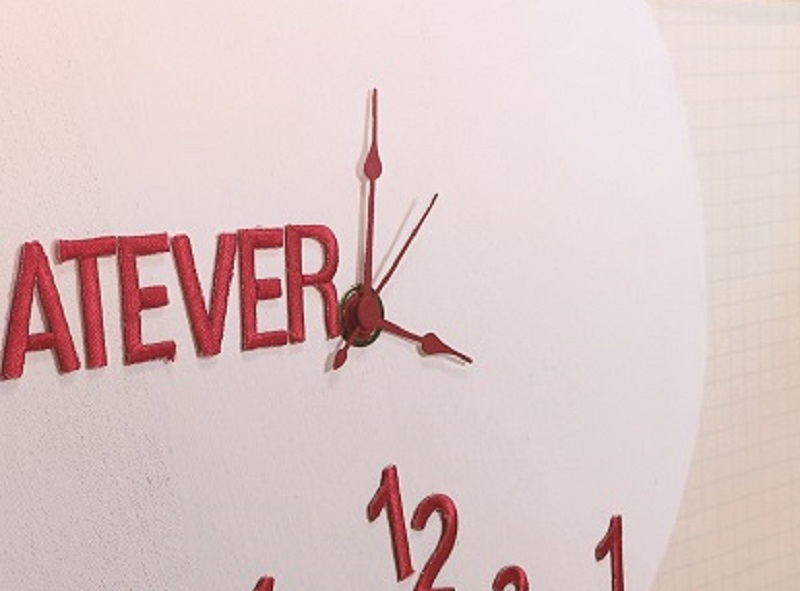 Even though it is love-themed, it doesn't scream "Valentines Day," so it can stay out all year long. I used white letters in the bottom corner of the frame. I like to add doodles to my projects. 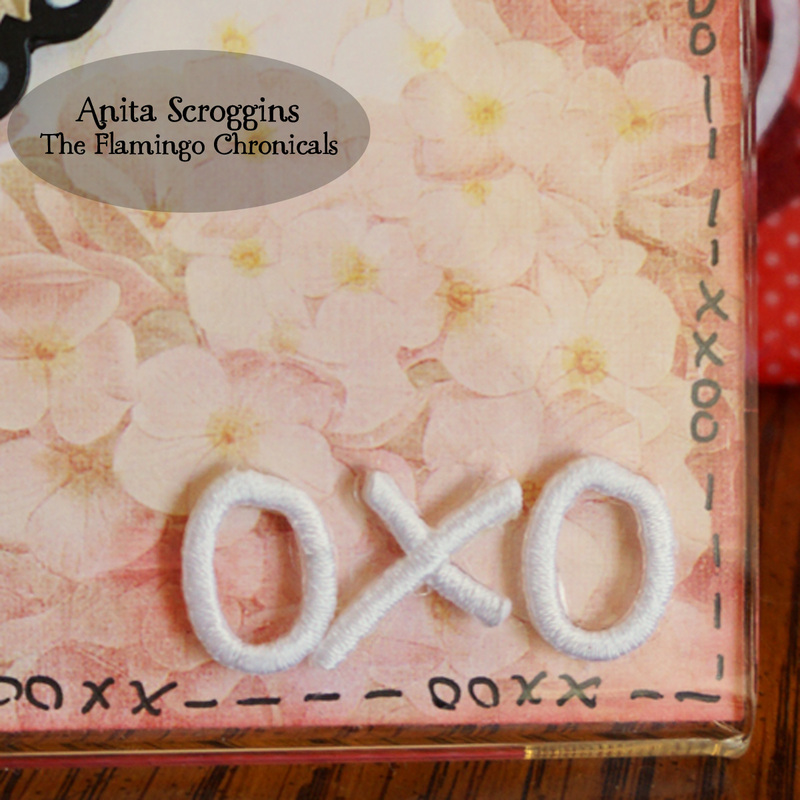 For this one I used coordinating X's and O's around the edge of the background paper to tie into the Joy letters. 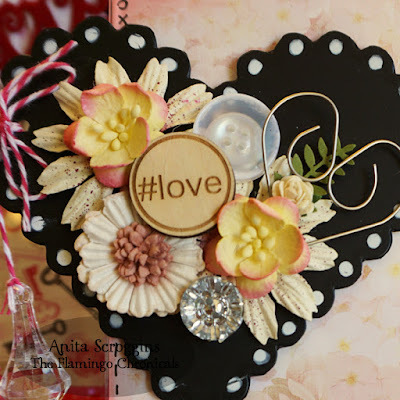 I added a heart woodcut from chalkboard cardstock and piled lots of pretties on it. Who doesn't love sparkles and flowers? The woodcut, heart paperclip, and large rhinestone are all from Maya Road. Everything else is from my stash (which indicates I have too much stuff, I am pretty sure!). 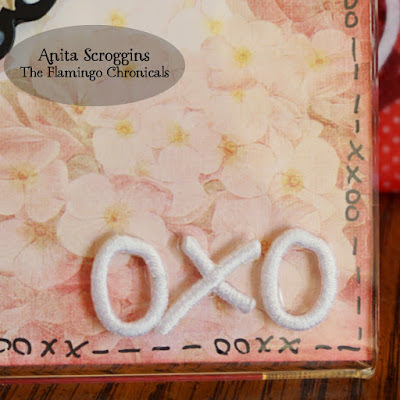 Use embroidered letters to bring JOY to your jewelry! 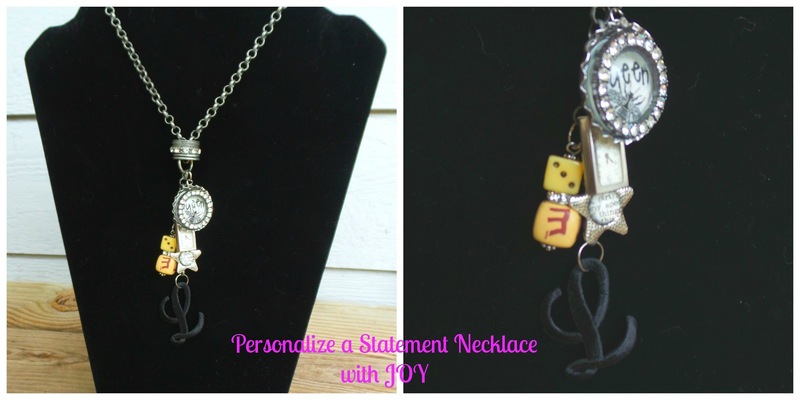 I made this fun statement necklace with charms and findings from my craft store. Then using a jump ring, I attached a large JOY embroidered script letter to the bottom of the chain. It makes a fun and eye-catching addition to a bold statement necklace! Look for JOY letters at your favorite craft store.